Witnesses called flight "unsettling," "absolute travesty"
NEW YORK (CNN) -- A White House official apologized Monday after he OK'd a large aircraft to fly low over Manhattan -- a sight that sent people reminded of 9/11 running in fear. Witnesses reported seeing the plane circle over the Upper New York Bay near the Statue of Liberty. 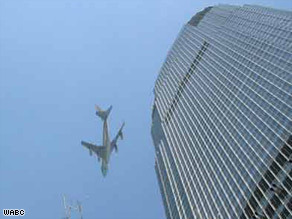 "I was here on 9/11," said iReporter Tom Kruk, who saw the plane as he was getting coffee Monday morning and snapped a photo. Kruk called the sight of the aircraft low in the sky "unsettling." The huge aircraft, which functions as Air Force One when the president is aboard, was taking part in a classified, government-sanctioned photo shoot, the Federal Aviation Administration said. Witnesses reported seeing the plane circle over the Upper New York Bay near the Statue of Liberty before flying up the Hudson River. It was accompanied by two F-16s. Two officials told CNN the White House Military Office was trying to update its file photos of Air Force One. The officials said the president was angry when he learned Monday afternoon about the flight, which sparked fear in the New York-New Jersey area. "First thing is, I'm annoyed -- furious is a better word -- that I wasn't told," he said, calling the aviation administration's decision to withhold details about the flight "ridiculous" and "poor judgment." Garcia-Rose is considering filing a class-action suit against the government for sanctioning the plane's unannounced flight. "I believe the government has done something really wrong," she said. Capt. Anna Carpenter of Andrews Air Force Base said local law enforcement agencies and the Federal Aviation Administration had been given notice of the exercise. New York Police Deputy Commissioner Paul J. Browne said the department had been alerted to the flight by the federal agency "with directives to local authorities not to disclose information about it." Sen. Chuck Schumer echoed the mayor's sentiments in a separate news conference Monday afternoon, saying the Federal Aviation Administration should have notified the public to avoid panic. "It is absolutely outrageous and appalling to think that the FAA would plan such a photo shoot and not warn the public, knowing full well New Yorkers still have the vivid memory of 9/11 sketched in their minds," the New York Democrat said. Schumer said the FAA's decision to not announce the fly-by "really borders on being either cruel or very very stupid." Building evacuations took place across the Hudson River in Jersey City, New Jersey.